Open on a Thursday lunchtime to provide refreshments (mostly tea and coffee) to those that had attended the memorial service and unveiling of a plaque in memory the seven people who died in the tragic fire at the nearby Crypt restaurant/bar forty two years ago today. A moving ceremony well supported by Kent Fire and Rescue and others. 3 Piers - Blackpool Bitter 4.00 A dark copper/amber traditional bitter ale. I arrived soon after opening time for a quick one and stayed for the whole session which was caused by a combination of good beer and atmsophere plus cancelled homeward bound trains. A thoroughly enjoyable afternoon. Hopdaemon - Incubus 4.00 First pints truly excellent plus the last one from the cask which was not as good as the first two but quite O.K. Iron Pier - Cast Iron Stout 4.70 A good dry stout. Friday evening and very pleasant, there was a couple playing Chess with an enthusiastic audience and another group of people playing board games. I met up with a former work colleague by chance. Sunday and busy for the entire session, mostly regulars but a few first time visitors who seemed to enjoy the place. Excellent nibbles as usual on a Sunday. Mid evening visit, my first for nearly 2 years. The pub sells several KeyKeg beers in addition to its cask ale offering. Stood at the pulpit all the stay. Afternoon visit and a very good welcome from Katherine and Peter. I did not list all the beers on sale but there were a few strong dark ones. Dark Star - Hophead (some, if not most, also brewed by Fuller's) 3.80 A Chiswick brew and superb, best of the Chiswick Hophead that I have tried so far. I made two visits in here tonight and a splendid atmosphere. Peter the guv told me that he had featured in a BBC Inside Out programme that was shown the previous Monday so watched that on iplayer when I got home. Dark Star - Hophead (some, if not most, also brewed by Fuller's) 3.80 I do not know whether this was a Sussex or Chiswick version of this beer but it was served in excellent condition only marred by the strong smell of aniseed permeating from what the person next to me was drinking. Pig & Porter - Blackbird Dry Stout 4.00 Not Tried This ran out. I arrived soon after opening time and the pub was already busy as a good number of people had forgotten to put their clocks and watches back one hour. A good atmosphere and a good selection of biscuits, cheese and roast potatoes for nibbles. Ramsgate Brewery (Gadds') - War Horse 4.00 An very good ruby red bitter. Evening visit and a good crowd in. Evening given 2030 hours. Place in darkness yet opening hours in window say open until 10pm. No other notice of reason for closure. Annoying for what is a destination Micropub. The pub is found in Dover, Kent, CT16 1JH. 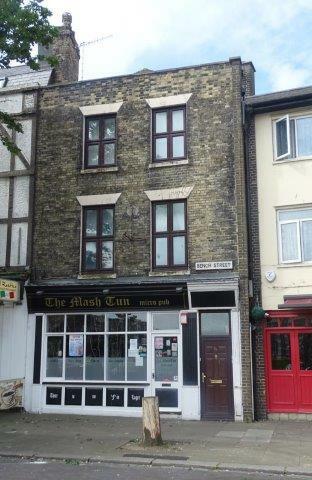 Micropub situated close to the Market Square in Dover in the premises previously occupied by Pier Three. It has comfortable chairs (including several chesterfields) plus tables and chairs at the side. The pub has a 200 years old church pulpit instead of a bar. 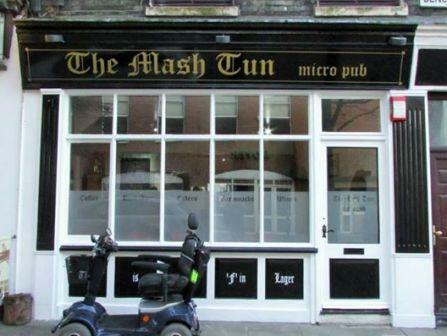 The licensees have stated an intention to set up a micro-brewery at the rear but it has not, to date, come to fruition. Has become renowned for its cask ales and a wide range of real ciders and perries, all sold under gravity dispense from a temperature controlled cellar room behind the pulpit bar. We have visited this pub 33 times, seen 71 different beers and tried 37 of them. This pub was formally know as the Pier Three.